We started purchasing the ribbon wholesale, and saved money. Ya it took us a few years to figure out that we could buy things in bulk....again, don't get me started. So, new ribbon a few changes now that we are "big time" (and yes I am doing air quotes). Also some of the colors may have changed a bit, or shall I say when not hand painted we were NOT able to match colors exactly and stay consistent (psst, check post from last week if you want to hear how I feel about hand painting) with our products. And, lastly we knew that we needed professional photographs - my snapshots on the brick patio - not so good. I was a nervous wreck about our "changes" with our products. 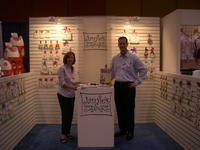 We had a good amount of exposure on the web, some catalogs and a large amount of stores. Mind you it was 2004, I was less than two years in I did NOT want to blow it. So, we had all of our products professionally photographed - yes all of them. It consisted of about 2o Name Tiles, 20 Name Plaques, 6 birth certificates and 3 brand spanking new ornaments - yep, big time. This is laughable now that we are hitting the 350 mark on products....but still it was big for us at the time. Our photographer offered to burn cd's for us (again we were not so sophisticated back then) so we could send to all of our channels - it was only about 50 at the time. He arrived late on a Wednesday with our cd's guaranteed they were good - we (me, okay my husband may have helped) stuffed them in Fed Ex envelopes and mailed them off, 2-day. Friday came, and we had plans. We left Friday. Then, then......THEN Darin and I dropped kids (and dog) at parents and drove to coast for some R & R and work on business. The cd's we sent out were blank, yes I said blank. I did not check the cd's.........yep, never checked one, just sent. I sent blank cd's, all over the country. And, if memory (and bank accounts) serve me right, I paid for expedited shipping......brilliant! So Whatcha Going to Do? We freaked out, well I did. My husband figured our photographer would give us a break....me not so much. I kept leaving frantic (um cell service not so good near the OCEAN) messages demanding, asking and then begging him to fix the problem. This was probably the first time I thought I would have a nervous break-down over work. I had everything riding on this, I wanted it to be perfect...older, wiser me knows it is never perfect. Luckily we had our brilliant web designer post the images up on a back door for our channels to browse through. I mean in less than 24 hours they were up and ready to pull down if you had the site information. Had to then smack self in face about 14 times wondering why we did not think of that sooner. Our photographer did make do, and he did give us free cd's (I still have a few if anyone wants one) and he did give us a discount. B. Cared that the cd was blank, I had a good reputation, it was August, they KNEW I would make do. C. Got my products up before I attended the ABC Kids Expo - ya, so much for the fire drill, I was a month early and a bit too stressed to listen. It was flippin' September, not December! D. It did not hurt sales one iota. Nope, did not change things - no glip, no glup, no blip in our sales, we continued to grow at a steady pace. So, in the end what I learned was um I might of over re-acted a tad bit (my husband would say more than a tad, but who's blog is this anyways?) and it ended up to not affect us in anyway. I wish I was able to calm down that "me" of 4 years ago and tell her it would all work out. Oh, and I would tell her also that that her lipstick was too dark, she was carrying a bit too many pounds and oh and when husband throws you a surprise birthday party do not, and I repeat DO NOT drink the apple-tini's! Wait, seriously - if I were to do it again, you should enjoy life more and worry less, Dang - modern me is SOOO much smarter than the old me! You continue to amaze me with what you have learned and are willing to share. Your customers must recognize good karma when they see/feel it. I get it just by reading your blog. I'm at the very beginning of this adventure, and you give me so much to look forward to. Oh what a great post. I am TERRIFIED of going into a show like that...I want to someday, but frankly...all those little details leave room for so many goof ups! I am impressed that was the only one! Thanks for sharing all your list...it is really helpful to put it all into perspective. AND I think that older and wiser is needed to get through this kind of business! Good for you! LOL! Oh Jamie, so good that you were able to roll with it. Although at the time, I'm sure it was panic inducing indeed...would me! Great post. I often think that, too. About the older me being so much smarter and wiser and wishing I could go back and fix or correct the mistakes of the past. Better to laugh them off, like you did I think. You have no idea how much this just helped calm my nerves as I prepare for my first tradeshow!